This time I was with some group of fighters that sparred regularly. I managed to piss off a really big guy, so to help me survive my next fight I brought in a weapon: A double-barreled shotgun. Now like most video game fighters, guns were incredibly non-lethal. It does damage to be sure, but a couple of bullets kill no one. This weapon was like a mix between TF2's Force-A-Nature and Killing Floor's Hunting Shotgun, with the ability to propel me into the air when fired downward, and the ability to fire both barrels at once. This combined with the long reload time of a break-action shotgun opened up a whole new array of battle strategies! And more importantly: was damn fun to use! Think of shooting it as a special/heavy attack and standard bashing him with the gun as the light/medium attacks. This guy brought in a machine gun with a spinning sawblade on the end. Near the end of the battle he got too close with the blade and I had to use my gun as a shield. This tore it up and it became useless aside from when used as a club. Still managed to win though. Afterward I spoke with the fight organizer and weapons were allowed to be used in standard battles. I got a new shotgun for it! 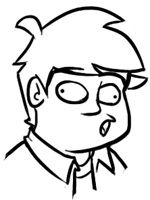 I'm guessing I had a fighting dream 'cuz last night I played BlazBlue with MarioGamer after the convention. Got quite a few wins in despite not knowing any character attacks due to a rule I learned from other fighting games: Special attacks are nice, but are only good for certain circumstances. Standard attacks and jump combos will rule the rest of the time, which are the same in nearly every fighter for nearly every character. Well, in ALL my dreams I fight someone/something, but this one was actually like a fighting game. Now if you'll excuse me I want to see if I can recreate my dream with the Force-A-Nature in TF2. Funny actually, I had a dream last night where the Scout got a new unlock which was a single-shot rifle that did around 140-150 damage at mid range. Also; related to dwarf fortress, dwarves and other races can now write books! They often churn them out about things they like or have experienced, so you often find dwarves suddenly announcing that they just wrote a book called "The Moose: Natural or Supernatural"
My favourite so far though, was a vampire who infiltrated my fortress by pretending to be a farmer. He liked to throw in a few good words about vampires to the other dwarves, and eventually wrote a book called "Your Friend, the Vampire"
Wow, I just made a lot of friends on popular Brony site, Equestria Daily. Kids today don't understand quality television. ...I sound like an old man now. Get offah mah lawn! Go back to playing Call of Duty and yelling profanity into your microphone with your crackly prepubescent voice, kiddies. This show's for grownups. And now everyone's high-fiving me. High-Fours, then! Which finger is your least favorite? My brain went to sleep and I forgot to answer this. DEPENDS. DO I GET TO REMOVE IT FROM YOUR HAND? I'm going to share this great little movie. Wanted to mod the Killing Floor soundtrack some more, so I'm searching for songs other than Bowser's Castle to replace songs with. Can't throw "Masters of the Desert" from Sonic Adventure 2 into Killing Floor because the version I ripped off the CD is .m4a, and I can't open that in Audacity. I thought it fit the mood for "Vs. Patriarch" perfectly. The search for songs to mod in continues! Who's dropping those phat beats? Of course Chaos would post that. Oh mah gosh that is cute! Vinyl Scratch is the cutest DJ ever. And Dave Strider is the most rad. Seems the coupons I got from Valve during the Christmas event are expiring soon. Can't use them on anything I want sadly. Well, I can, but I'm waiting to get a PC so I can actually play those games. Or should I just buy it now? Well if anyone wants some games by Valve or Max Payne 2, let me know. I accept TF2 weapons in trade, and who doesn't have a couple of those they don't need? 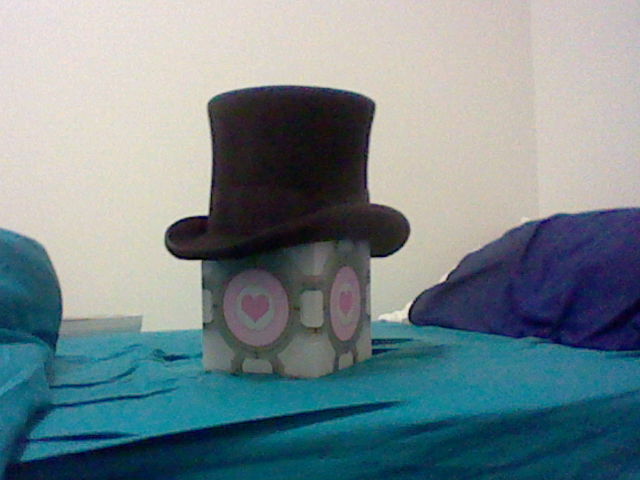 I just took a picture of a Companion Cube wearing a top hat and suddenly my DA page is flooded with favorites. Why is it always the stuff that takes two seconds to do that is the most popular? Honestly, if I wanted thousands of favorites and watchers I'd probably start drawing ponies. @Chaos, that is so the truth XDD DA is cruel. I think the thread had an aneurysm and died. Still haven't played SS to have an opinion. I mean I respect your opinion and all, just as long as you understand you are wrong.